On April 10 1980 Ian, Georgine and two girls Helen and Gina picked up hand carry items and trudged wearily onto a Kuwait Airways flight to London. We’d been due to depart hours before take off, but for some reason I’m still not clear on the Indian Air Force decided to conduct exercises and the airport was shut down for several hours. The newly constructed Mumbai airport had not been finished so we’d spent much of that time squatting on our luggage and didn’t look forward to the long trip strapped into airplane seats. We were in for a pleasant surprise. Kuwait Air turned out to be one of the best airlines I’ve traveled and the service was excellent. I’ll admit to periods of anxiety on the flight to London though. It had nothing to do with the service, but I was to be in charge of a group tour through London and had never been to that city before. My fears were justified as I did lose a bus load of people during that stopover. However it was the visit to the US we were all looking forward to. That was also going to be our first entry, and we intended to make it a family educational trip once my responsibilities at the Dallas convention were over. I did have some Universities to visit on the east and west coasts afterwards, but had a total of three months leave so there was ample time to mix pleasure with business. Our first entry happened to be New York. This was in the days when immigration and customs formalities were much simpler than they are today. Australian passports included children on their Mother’s document in those days, and we’d been assured by the US Embassy in Mumbai one visa stamp covered the three of them. Not so, said the Immigration Officials in New York who threatened to put us on a plane back to India on arrival. Fortunately a sensible Senior Officer surfaced and stamped us in but cautioned us that future entries would need to have this corrected. That ruled out a side trip to Canada we’d planned but we were grateful for his consideration. To my surprise on moving to New York Domestic Terminal for the final trip to Washington DC we found our group of 54 had been booked forward on a 35 seat commuter with others apart from our group clamoring to get on. The problem was solved when embarrassed check in staff offered a flight next day with a cash bonus of $400 to those prepared to wait. It was rather hard to get any of my group to agree to accompany us to Washington that night after such an offer. Indians are very businesslike and appreciate bargains. The luggage of those who stayed behind in New York arrived in Washington DC with us late that evening, and our luggage arrived the next day with the newly rich stragglers. We were booked to travel by Greyhound Bus to Dallas. If you search through my blogs you’ll find one about this trip and the man who thought trash cans were mailing boxes. We were amazed at the skill of our bus drivers who’d change seats neatly every few hours while the bus was hurtling through southern states on the way to Texas. I’ll never forget the song “Funky Town” played from the time of departure to arrival in Dallas much to Helen’s delight. With the convention over we returned to Washington DC and joined a bus tour of New England States. There are two places we remember well. 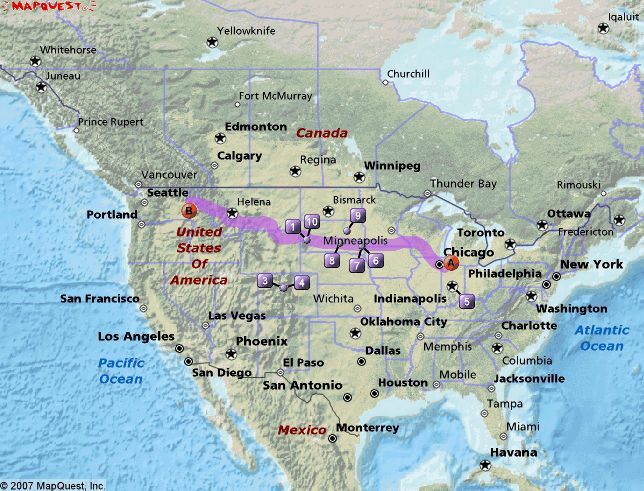 The first was Buffalo, New York where we watched jealously as the rest traveled into Canada and back while we stood and waited for them to return. The New York Immigration had done a good job putting the fear of hell into us. The second was the trip to Plymouth where we viewed the Mayflower and village reconstruction depicting the time of the Pilgrims. Recreation Park we’d been scheduled to stay the night with we were interested in buying a car to take us around the nation. Early next morning the manager knocked on our door and showed us a shiny Plymouth Volare Wagon he’d borrowed from a dealer in the town nearby. We purchased it on the spot, and after going through purchase and insurance formalities in town proudly left the bus tour to conduct our own personal tour of the US in our own car. Our first target destination was Michigan where we arranged to meet with friends we’d worked with at a college in India and who were now teaching in the US. To our surprise we also discovered some of our former students who were doing post graduate degrees, and together we headed for another destination we haven’t forgotten over the years. This was the Old Dutch Village in Michigan. There we saw acres of tulips in bloom and enjoyed the reenactment of early pioneer years by actors in traditional costume. However when we saw the weighing machine used to determine if we were bringing witchcraft into these hallowed fields, and saw the determination on the faces of locals to test these foreigners out we fled and resumed our journey. Reaching I 90 Toll Way we turned west for the 1970 mile journey to visit friends in Moscow, Idaho. We estimated this would take approximately four days if we maintained 500 miles a day and didn’t make too many long stopovers. But armed with mountains of tourist brochures and imagining this would be our one and only trip to the US we wondered how we could ever maintain such a tight schedule. I knew we were heading for Johnny Appleseed country, and for some reason that story had always tweaked my imagination. However this was not on the fun list for our ten and thirteen year old daughters. It suddenly dawned on them they’d be stuck in the back of the car for weeks on end and the tour idea turned sour at that point. Johnny Appleseed was vetoed and I had to content myself in having passed his advertising billboards many times along the way. My reasoning with the girls was ineffective. They let it be known they’d had quite enough of pioneer cemeteries and old buildings and wanted some action. The “funky town” bus with dancing bus drivers to Dallas had been cool. More of that please! It was on I 90 we saw a sight we’d never experienced before. A strange funnel like black thing appeared on the horizon far up to the northeast and lingered for a time as we sped west. Later that evening as we relaxed in a Motel 6 it was revealed on TV a tornado had swept through the Kalamazoo area. We were happy we missed that tourist attraction. Sweeping past Chicago was interesting. It was going to work time and all exit roads were a huge parking lot with nothing moving. We were glad we’d chosen the toll way. Somewhere in the vicinity of Chicago there was a Howard Johnson truck stop, rest area and restaurant. This would be the coolest restaurant we visited in the US as it was located on a bridge over the toll way and we ate breakfast watching an army of vehicles rush toward us and disappear underneath. This was the action the girls were looking for and it took some urging to get them back in the car. The marvel of a multi-lane system soon ended, and to our surprise we exited to a section of the freeway now under major repair. We bumped and crashed over this section for an hour and remember this because it was so out of character with the rest of our journey around the US. I guess we’d have been in South Dakota by the end of the first day. Summer time in the US can be a bit misleading as the further you go north the longer the days, and on that first day I remember suddenly discovering it was 9pm which would account for the racket issuing from back seats. The kids were hungry and tired! I don’t remember the location, but as we were going steady with Motel 6 for obvious reasons we’d have been in a city that offered that service. That evening we made a resolution which we kept for the remainder of the journey while our kids fed coins into the massage bed. Henceforth we’d depart at 4 am and let the kids sleep in the car for a further couple of hours before breakfast. We’d take frequent rest stops, and finish our driving at 4 pm after finding a suitable Motel 6 with pool and TV. Pool and TV were to become highlights of our intended educational tour. By the time our cherubs awoke in the car next day the back seat was uncharacteristically quiet. After the ruckus of the previous day this was a bit alarming. Were they sick? No, we were assured all was well. But after a while a little face appeared close to my ear. “Dad, what’s the Badlands?” Then it all became clear. For a hundred miles we’d been warned by billboards we were heading for the Badlands and obviously the girls could read well. We learned later they expected gunslingers and Indians to ride over those wastelands and take us into captivity. They wanted nothing to do with the Badlands. We reassured them all was well. I know we stayed at Rapid City because that was our staging point for exit from I 90 and a trip to Mount Rushmore. We trooped through the tourist traps, took pictures and purchased the obligatory curios which I’ve looked for diligently without success since beginning to write this story. That of course included our curios purchased in Custer’s own commemorative town. Then we were back briefly on I 90 soon to exit in an approach from the south to Yellowstone Park so we could say we’d seen Old Faithful and record this historic event as evidence to show to skeptical friends. Now the car we’d purchased in Massachusetts had rear snow tires and these had made an annoying racket as we’d proceeded west on dry roads, but we were about to learn what snow tires are good for. Bear in mind it’s now summer in the US. We’d only been at the park for a brief time when two things happened simultaneously. Old Faithful did its thing for us and a loud speaker announcement told us we needed to vacate the park immediately because a heavy snow storm was on the way. A snow storm in summer? We headed north to rejoin I 90 and the snow storm dumped. This was to be our first experience driving in a snow storm and we became alarmed as visibility lowered and windscreen wipers began to labor under a heavy load of snow. Banks of snow had already begun to form by the roadside as we moved into the storm and we sometimes wondered where the road headed. We’d not seen a car on the road for some time and began to feel we’d been foolish to head north. But the snow tires did their work and we made it to I 90. Once again a timely experience had been successful in reducing the back seat noise levels. I think it was Montana where we traveled in early morning darkness and saw the silhouettes of oil well pumps drinking from the depths of the earth like cormorants fishing. In our imagination we saw prehistoric animals feasting on the lonely landscape and pausing momentarily to look at us as we passed them mile after mile. Then before we knew it we were exiting on Route 12 to follow a beautiful cascading river for mile after winding mile heading for our destination Moscow Idaho close to the Washington State border and a rendezvous with fellow workers now on PhD study leave. Ralph and Vi greeted us enthusiastically as we parked our Plymouth in their Moscow home driveway. We’d been teachers together on campus in Pune, India and they were missing the excitement of their workplace and needed to talk. They were on study leave finishing off a PhD. Our kids gravitated immediately to the massage chair and began to give it a thorough workout. They’d become addicted to the Motel 6 massage beds and were delighted to find the service also came in chairs. We were instructed to buy one and ship it back to India with us, but after checking on the price decided to put that suggestion on hold. The two days we’d assigned for this stopover were necessary relaxation after a relatively fast 1,970 mile journey, and it didn’t take much persuasion for us to stay over for an additional day while Ralph went over the maps with us to find the best route for a visit to Mt St Helens in Washington State. On the third day we headed for the Mall and spent several hours shopping. When we eventually emerged we were surprised to find an eerie blackness had descended over the city and the sky took on a dark green, almost black look. Were we in for the storm of the century? Ralph tuned in the car radio and we understood what was in store for us. Mt St Helens had blown its top! Had we left as originally planned we’d have been too close to that destination for comfort. Within an hour ash began to rain from the sky and by the next morning it was falling like heavy snow. Streets, houses and cars were covered with a thick layer of ash by next morning. Ralph and Vi suggested we leave Moscow together and stay with their relatives at Walla Walla Washington, which by some strange quirk of nature was not in the wind path and so had avoided ash fallout though closer to the mountain. So washing as much of the falling ash from our windows as possible we headed directly south intending to move out of the wind path and circle around to Walla Walla. Ash continued to fall and we tried to avoid using windscreen wipers as much as we could on learning volcanic ash is highly abrasive. Knowing these fine particles would eventually find their way into the motor was another worry. This car had to last us for several thousand additional miles yet. Leaving Walla Walla behind we followed the beautiful Columbia River on the Oregon section of I 84. With majestic Mt Hood towering above us to the left and the Columbia River to our right for much of the journey to Portland we could fully understand the deep passion those from the Northwest have for their country. After the Mt St Helens experience we kept a wary eye on Mt Hood until it eventually faded from view. 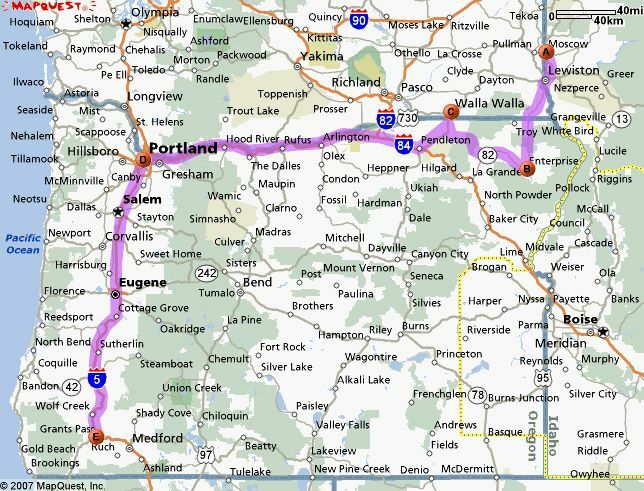 After successfully negotiating the Portland interchange spaghetti we found our way onto I 5 and turned south headed for our next stopover at Grant’s Pass Oregon. Unfortunately I can’t remember exactly where we stopped to visit the free range animal park where the ostrich attempted to break the glass and pay a visit to the kids in the back seat. Up to that point both kids had clearly marked personal territory in the back seat, and the violation of that sacred territory would set up shrill alarm signals guaranteed to get Mom’s attention and intervention every time. But with the ostrich attack territorial claims evaporated and they’d be pressed together up against the door opposite to whichever side the ostrich was attempting to enter. It was rather amusing. The other Oregon event was a brief stopover at the haunted house. We paid our money and entered a sinister looking cloth doorway to be shrieked at, jostled by skeletons and peek-a-booed by the most frightening apparitions you could imagine. An organ ground out discordant music to urge the spooks into action. Georgine was on my back and both children fighting for the limited space between by legs and heading back out the entrance door within one minute of our entry to the surprise of a startled attendant. She refunded our money and burst into laughter as we headed for the car. We reached Grants Pass in the evening and found a suitable Motel. There were no Motel 6’s available in this part of the world. Several things come to mind from that visit. First there was the impressive statue of the Neanderthal in the middle of the city. Second my eldest Helen decided to scare me silly at a pay laundry by rushing up with what looked like a nail through her finger. While I was winding up my legs attempting a fast trip to the nearest hospital she removed the little trick gadget from her finger. Got it out of a slot machine with some candy it seems. The kids really enjoyed getting back at me for laughing when they had their experience with the ostrich. I decided it was time to check the car in for service, and in particular flush out the remnants of ash from the motor, so looked for a reasonably honest auto shop. The service was fixed price so I felt there was little chance of being ripped off. However when the mechanic called me to look at the snow tires while the car was up on the hoist, and there showed me a deep cut on each of the back tires I knew I’d made a poor choice. The cuts were obviously new. Not much point in arguing seeing I had to keep to a time schedule so I replaced those faithful snow tires with new ones paid the bill and made a mental note to never visit that shop again. Our laundry having now been successfully completed, and leaving behind an auto repair shop very satisfied with these Australian tourists we headed for Crescent City and a tryst with the Pacific Ocean. This was our ocean and we paused to give it the respect it deserved as a familiar friend. But the north Pacific was quite different to what we were accustomed to. Some ultimate force had decreed the removal of palm trees, warm balmy breezes and replaced these joys with an intermittent stern coastline and cold, sometimes foggy atmosphere. Still it was our Pacific and just as entitled to its moods as we humans feel free to enjoy. Our target destination was the Redwoods. Passing through that forest with its majestic soaring trees was an experience never to be forgotten. When we came to the spot where some enlightened persons of the past had cut away the trunk to allow for a drive through we were both impressed at the magnitude of those mighty tree trunks and appalled that human beings would have desecrated this sacred edifice. In that area there were tourist traps with numberless objects crafted from those noble giants and we did our part in enriching those who waited anxiously for tourists and their cash. In that pristine paradise we temporarily forgot our beloved palms and beaches in the South Pacific. 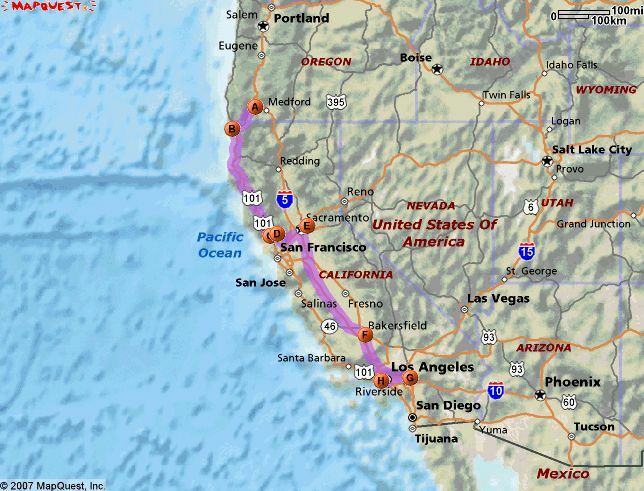 But we had to move on and headed down I 101 to Santa Rosa and an exit to our next destination, the Napa Valley. The Napa Valley is a virtual Italy experience with an American slant, and everywhere can be seen mile after mile of some of the choicest grapes in the world. Set among rolling hills our stopover was to prove another of the unforgettable places in our itinerary. We saw the mini “Old Faithful” at Calistoga and Georgine sampled delights of the hobby shop at the old railway station which no longer claims a rail service. We delighted in the St Helena hills and somehow managed to live through the four way lights at the bottom of the hill where vehicles lined up to challenge each other for the right to be first to cross. The multitude of morning colorful hot air balloons against a background of surrounding hills is a sight worth seeing. With a tinge of sadness we headed for Vacaville, there to be entertained by our first parade experience after spending the night there. I have no idea what the parade was to commemorate, maybe it was a trial run for July 4. After a business appointment in Roseville near Sacramento we were on our way down I 5 headed for our next appointment in Los Angeles. The US has some of the best rest stop areas in the world and it was at one of these our girls came face to face with real life TV. Hastening into the “girls room” they were back in seconds trembling and looking wide eyed at the place they really needed to go to. We soon saw why! Emerging from the “girls” was a Native American resplendent in full costume, and that included feathers and all. I guess they’d seen too many Hollywood movies. Anyway we explained these folk were really no different to any of the other people they were familiar with, and our Native American woman confirmed this with one of the nicest smiles I’ve seen. Our kids were convinced by the smile and hastened back about their business. The next rest stop was to be just outside Bakersfield and while preparing our lunch Georgine suddenly felt giddy and had trouble standing. Maybe it was catching I thought as I tried hard to stay on my feet. It was Shaky Sunday according to a later radio commentator, one of the frequent events in California. So we added earthquake to our gathering list of notable events and filed it with the list including tornado and heavy summer snow storm. We were being entertained in royal style. Exiting I 5 we turned into the high country and headed for Redlands where we had our Motel booking. This was close to our next business appointment at Loma Linda University. Looking down from the mountains on the Los Angeles plain below was the thickest pollution haze we’d encountered up to this time and we wondered how human beings could live in those conditions. Once descended though the haze was not as bad as it looked from the hills and we soon forgot we were breathing pure carbon monoxide and began to enjoy the experience. We were met by former students now studying and working in that area, and it was to one of these former students Sonny we’d entrust our car as we headed out to Australia within the next few days for a month with relatives before returning to LA. Surprising as it may seem the ticketing for this round the world journey was cheaper than a Mumbai to Sydney return air journey at the time. I think we did all the major LA tourist stuff, Disneyland, Knott’s Berry Farm, Universal Studios and wherever we happened to find a group being entertained in and around the city. Sonny and his girlfriend treated us to a day at Big Bear Lake where we temporarily exited the smog to enjoy that beautiful playground of LA citizens. 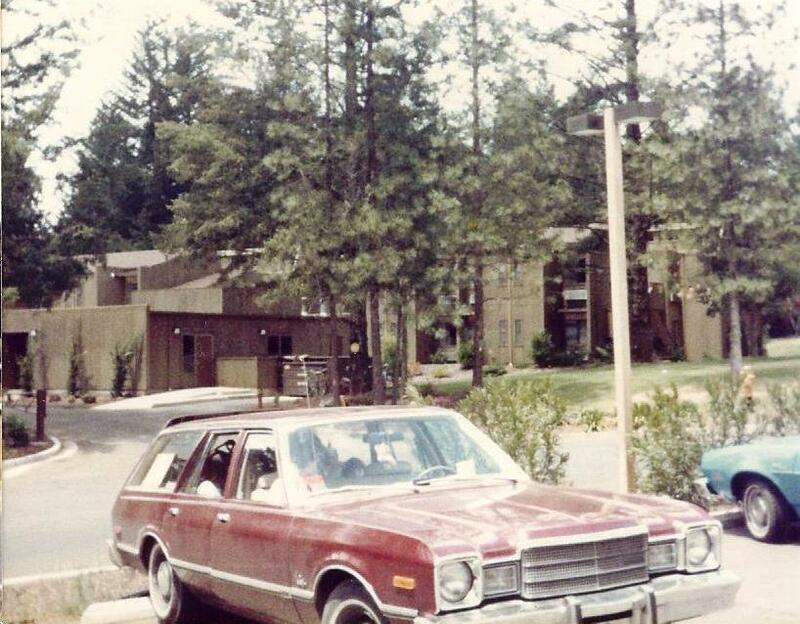 On June 1 we handed our car to Sonny and arranged for him to pick us up at the LA Airport when we arrived back from Australia July 4, 1980 to continue our journey around the United States. On July 4, 1980 we cruised into LA on a Continental Airlines flight from Sydney Australia and right on schedule. The trip had been exhausting as these long distance trips usually are across the Pacific pond and our kids were delighted to be out of their confining economy class seats and back on terra firma once again. Immigration and Customs formalities were simple in those less threatening times and we were soon out at the luggage carousel looking anxiously at the arrivals door for Sonny and our car. There he was with his trade mark smile. We sighed with relief; only one extra freeway trip to Redlands and the same motel we’d stayed in before leaving for our Australia jaunt. This motel had been the unanimous vote of our cherubs as there was a Pancake House diner next to the motel and they needed their daily stack for survival. We were however too tired to attend any July 4 parades and soaked airplane grime off tired bodies before crashing for what we hoped would be a long anticipated sleep. No one sleeps well on a plane. Our kids being at an impressionable age we had to regularly check on what they were watching on screen. I remember dozing; to awake and do one of my parental checks finding them wide eyed studying a body crashing around in a laundry dryer on screen. After that I made sure to keep one eye open for the rest of the trip. But jet lag is a fairly consistent form of travel irritation. No matter where I’ve traveled around the world I can be assured of waking right on schedule at 3 am. It doesn’t matter if there’s a 12 hour time difference or a 2 hour difference. My jet lagged body is programmed to adjust to waking time at 3 am, and in spite of inky blackness outside and nothing to do I’m wide awake. While the brain is wide awake and ready for action, my body is protesting loudly and telling the mind to shut down and go back to sleep! That tension carries through for a week before the body and mind decide to call a truce and settle on a more realistic 5 am waking time. I remember how long that night was after 3 am in Redlands. Our first morning out from the motel brought us to the realization Southern Cal is hotter than Hades in summertime. But you get conditioned to it, and Sonny was there to spend the day with us and introduce us to his girlfriend. She was a knock out, and this would of course explain why Sonny was rather distracted on our return. As our eldest daughter’s birthday was July 7 we decided to stay over and give her a choice as to what kind of birthday entertainment she’d like to have as a present. Oh no, another trip to Disneyland? We were going to repeat that all over again! Well we did and it was a wise choice because there was a celebration going on there that day and a lot more variety for us to enjoy the second time around. The evening parade and fireworks were well worth the stop over. We said goodbye to Sonny, not knowing that within a few weeks of our return to India he’d be killed in a car accident. As he’d been one of our favorite students at college, and had spent a great deal of time in our home we were in severe depression for a long time after that news reached us. Our next destination point was Tempe, Arizona. The blazing dry heat was overpowering us as we reached I 10 and set course for Phoenix. We’d attempted to install air conditioning in LA, but at that time of year were informed there’d be a one month waiting time before mechanics could schedule an appointment. So we invented our own air conditioning. At each refueling stop we’d each buy a bucket of ice cubes and hold those close to our nose to cool air inhaled. That seemed to work. Somewhere out on the California Arizona border we came to a broken down settlement with all the qualities of a wild-west frontier community. It was one of the few places we’d seen with a patch of trees so we assumed there must be a rare water hole nearby. But it had a diner, and we were in need of a late morning snack so paused for a boysenberry short stack with all those healthy toppings CA is well noted for. For a while the kids would have none of this. Accents are a funny thing and the waitress had the kids fairly well convinced we were getting ready for a feast of poison berries which reason told them would not be in their best interests. However to their relief they discovered we were not trying to poison them, and they finished their snack expeditiously. Our first impressions of Phoenix were that residents had taken all the seedy beer parlors and exiled them to the outskirts of town. They seemed to greet us one a mile on our way into the city, and were interspersed with scrapped cars posing at all angles in unusual artistic formations. But our destination Tempe was a neat residential area and here we found my sister-in-law and nephews. While they’d invited us to visit they were obviously surprised we’d diverted in our journey to do just that. 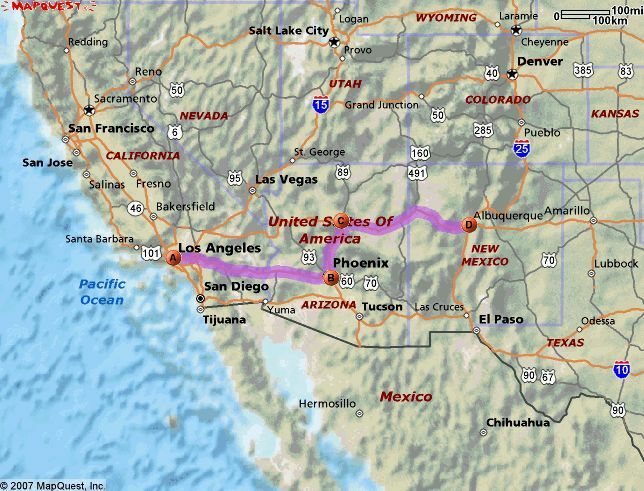 We visited with them and then headed north on I 17 to Flagstaff where we joined I 40 to continue our journey east. Flagstaff was a joy to behold after the dry and heat of the plain below and we marveled that in this dry state this green wooded community could exist. As we traveled across the border into New Mexico an eerie stillness seemed to descend on our journey. I 40 wasn’t a minor freeway but traffic was sparse and that was probably because of the intense heat of summer. I can remember one evening scanning the radio dial looking for some contact with humans. Most of the radio transmissions were in Spanish and we consulted our maps with urgency. Had we crossed into Mexico by mistake? But road signs confirmed we were far north of the Mexican border and headed in the right direction. Eventually we reached our destination Albuquerque. This outpost stays in my memory for one reason. As we found our motel and were moving in Georgine called down from the second storey balcony asking me to bring her balls of wool up with our luggage. Now my good wife is a knitter par excellence and wool is almost a sacred object to her. I should have known better, but decided to gain favor by delivering these precious objects immediately. Unfortunately my aim was a bit off and her wool landed on the roof of the motel. Now remember I’ve already stated this is very hot country, but at that moment a chill breeze broke loose over me and I was not in need of air conditioning that night, or the next, or the next. I’d sinned grievously, and as all husbands must from time to time I needed correction I’d long remember. Even today when the word Albuquerque is mentioned I’m treated to a frozen smile and narrowed eyes. Albuquerque is a name never to be mentioned in this house if peace and tranquility are desired. Taking leave of the Motel in Albuquerque I made a final attempt to view that recalcitrant wool on the roof above our room. Whereas it had been peeping at my distress the day before, now it had completely disappeared. With the sigh of one under severe censure I repacked the car and we were off again, heading east on I 40. Not being tempted to head north to check out Las Vegas, playground of The Rat Pack, we settled in for more roasting mind numbing miles to the Texas border and the rest of the 544 miles to Oklahoma City. Whether it was the sameness of the last few days journey, or just plain travel exhaustion we began to think it was time to end our travels and head for home. The kids had settled into a listless boredom, and we began to wish for those heady days across the top when we’d attempted to keep them quiet in the back seat. They’d seen quite enough, and wanted to go home. Oklahoma City arrived and they consoled themselves with the Motel pool and their favorite TV programs. Massage beds and chairs were just not part of the service in this part of the world and they missed that expected Motel enjoyment. However spirits began to pick up as we entered the far reaches of Oklahoma and entered the state of Arkansas where scenery changed to give us a taste of The South once again. We’d passed through Little Rock on our way to Dallas the first week of our initial entry into the US. The kids remembered our cool bus drivers on that journey, and joyous sounds of “Funky Town” emerged from the back seat happily signaling us their back seat hibernation was now ended. Contest over the back seat border between left and right now resumed in earnest and we were happy for the change. Things were back to normal! Our 470 mile journey from Oklahoma City came to an end at Memphis and we paused to enjoy one of the most famous cities the US has to offer. Memphis has so much to offer the tourist, but unfortunately we were beginning to come close to our scheduled departure date and needed to do purchasing in Washington DC before flying back to India. I’ve often been in situations where a language barrier made it difficult to get around, but hadn’t realized how different Australian English is from the Southern branch of the same language until my initial visit to a fast food outlet. After trying to understand several times what I was attempting to order the guy at the counter decided to ignore me and go to the next customer. Eventually someone who’d traveled the world came along to interpret and we managed to eat. The Sunday we left Memphis we decided to breakfast at a more up-market restaurant and negotiated the language barrier reasonably well. However we’d not been there long when an avalanche of church goers descended on the restaurant all done up in their Sunday best. They looked at us aghast! Dressed so casually on a Sunday? We sat and ate our breakfast aware that a multitude of disapproving eyes were watching our every movement, right up to the time the bill was settled and we exited that group of feasting saints. This brought to mind an experience we had in Montana on the forward journey when we exited the freeway looking for gas and food in a frontier town whose name I’ve now forgotten. The restaurant was like one of those bars depicted in Western movies with genuine swinging doors entrance. There was loud animated discussion as we entered the room, but then, instant silence as we seated ourselves. We were studied all the way through our meal, and those who did speak did so in whispers. Strangers were in town, and they were in potential danger! Whereas the trip from California to Oklahoma had been dry with mercury trying to leap out of the glass cylinder, Memphis was steamy hot. Crossing the mighty Mississippi early morning we saw the river enshrouded in a ghostly mist, and as we traveled on to Wytheville Virginia, our next stopover, we could see smoky hills of the Allegheny Mountains in the distance. Then we were in Wytheville and searching for Mathew at the private hospital he managed. As we’d worked with him in India in school administration we were anxious to know how he’d fared making a transition to such a different kind of administrative work. Little did I know at that time hospital administration would be the last job I’d do before going into retirement much later. Bidding farewell to the Mathew family in Wytheville we rejoined I 81 and headed northeast. We were warned substantial repairs were being done to the freeway ahead so decided to exit and follow an alternate route at Roanoke joining 221 to Lynchburg. During colonial times the early site of Roanoke was an important hub of trails and roads. The Great Wagon Road, one of the most heavily traveled roads of eighteenth century America ran from Philadelphia through Shenandoah Valley to the site of present day Roanoke where the Roanoke River passed through Blue Ridge. The Roanoke Gap proved a useful route for immigrants to settle Carolina Piedmont region and southwest to Tennessee and Kentucky. We were in pioneer territory and enjoying a kaleidoscope of its history as we passed through. Eventually we reached Lynchburg. In the Lynchburg Museum you can relive the city’s past, rich with tales of Monocan tribes, early Quaker settlers, reign of King Tobacco, bloody struggle of the Civil War, the New South and the drama of change in the twentieth century. Next stop was Charlottesville located in the centre of the state along the Rivanna River, just west of the Southwest Mountains which parallel Blue Ridge twenty miles to the West. We learned the centre was named for Queen Charlotte consort of King George the Third. During the American Revolutionary War the Convention Army was imprisoned in Charlottesville between 1779 and 1781 at the Albemarle Barracks. Unlike most of Virginia, Charlottesville was spared the brunt of the American Civil War. The only battle to take place in Charlottesville was the skirmish at Rio Hill in which Custer was repulsed by local Confederate militia. Thomas Jefferson was born nearby. Having brushed up on our early American history lessons we turned north to Culpepper and sped on to join I 66 for the dash to Washington DC, our final destination. Joining the beltway we headed north and then east to Silver Spring where we’d promised to look up a former work associate from India now resident there. James was delighted to see us and began to make plans for us to meet with former students and work associates insisting we stay at his home, but as we’d only a few days before presenting for our flight home had to curb his enthusiasm. We did get to see the Smithsonian under James’s watchful eye and also meet with some of our friends. Purchases had to be made to replace some of our ageing equipment and furnishings in India so for two days we rushed between warehouses and shipping agents getting this important job completed. We also had to dispose of our car, so gave it a thorough clean out. Seeping out from the secret crevices of the car came residual grey ash from Mt St Helens, something we’d become used to with each of the many washes the car had received since our visit to Moscow Idaho. 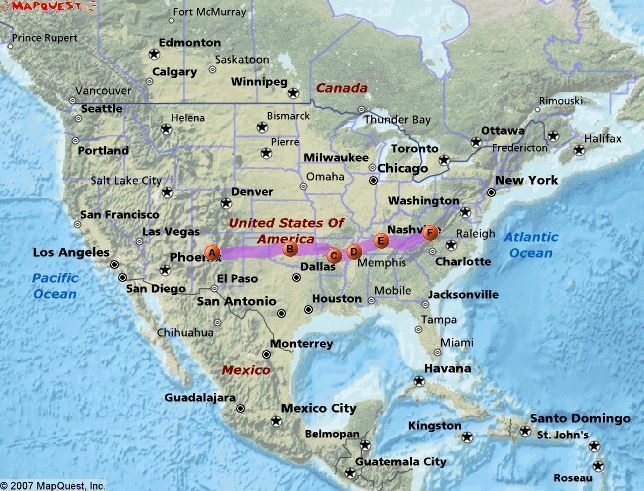 With one day to go before departure we took a deep breath and began to calculate interesting statistics of our first journey across the US. 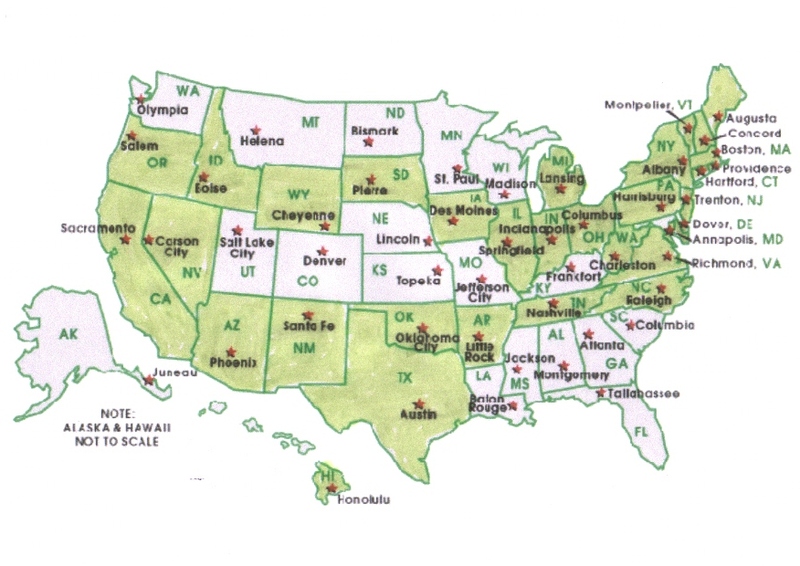 We’d visited 29 states including Hawaii on the side trip to Australia. In subsequent visits we’d add another eight states to that list. Total on the road travel time had been 116 hours, and miles covered 6,935. We’d purchased the car for $1,700 and sold it for $1,300. Our total out of pocket expenses had been $3,300 as we’d purchased almost all our meals in supermarkets and eaten at rest stops on the way. Occasionally we’d enjoyed the hospitality of friends. That would have to be the cheapest vacation we’ve enjoyed, and in spite of the veneer of boredom our girls tried to project at times this journey obviously convinced them they’d be citizens one day. They both are; one living in beautiful Washington State, and one in Connecticut. We’d arrived in Washington DC April 10, 1980, taken a Greyhound Bus to Dallas and returned, toured the New England States by bus. Purchased a car in Massachusetts and circled the continent, found time to make a one month trip to Australia to visit with relatives, and on July 23, 1980 said goodbye to the United States, thankful for the hospitality received and education acquired along the way. Little did we realize at the time visits to the US would become a regular feature as our children grew and received their college education in California, and business would require subsequent frequent trips. Here’s an after-thought. The shipment we’d arranged in Washington DC which we hoped to receive within a few weeks took nine months to arrive. By mistake our things were directed to Africa instead of India but it was all sorted out eventually and made a good New Year present in 1981. I had to return 3 times to continue/complete reading it. You’ve retained very detailed accounts of your trip. Not many do and care to – other than keeping some photos. As usual, your writing was engaging and informative. You made this trip in 1980 – I visited California through to Texas in 1979. My first trip there and thoroughly enjoyed myself – still retain pictures, hotel and Greyhound bus receipts, etc from that trip. Wonderful gracious people – all whom I met. Unfortunately, the only rude ones were the Asian Americans manning service counters – what an eye opener! I’ve visited the States several times since – increasingly disappointed with how the country had turned out. What a marvellous journal you’re working on to leave behind for your family. I have had good impressions of the US Immigration service except for New York where rudeness seems to have been part of their training exercises. lol. Fortunately the ones at the top of the heap, as I mentioned in my story above can be reasonable. It’s still a great country to tour and the further you get away from the cities the friendlier the people are. We tend to forget how generous they have been in defending us during the second world war. Australians will be ever grateful for coming to our aid when we needed a friend to help defend us. The US has been quite generous to their defeated enemies too. I feel so sorry for the current political and economic situation they seem to have gotten themselves into. We still need to have them as a counterbalance to some of the radical elements in the world who want to drive us back into caves with their slant on life. I’m sure you have digitized all your events and pictures as I have and made sure they are backed up appropriately. I’m surprised and gratified that a person as busy as you are had the time to visit and comment on my long blog. Cheers! Thank you. I admire all of those traits you mentioned and feel happy to be in the company of those who possess them. All of us have challenges in life, but a positive mind frame helps deal with the stuff that hits us daily doesn’t it? Yes, it does. Staying positive and smiling even when you don’t feel like it does wonders. What a spectacular journey you took! I loved reading this, I smiled through most of it, thinking back to many of the journey’s I and my brother took in the back of a station wagon with my parents. You were here when Mt. St Helens blew! I was in Seattle at the time. We had parties on rooftops, did you know that? After it all calmed down there was quite a market for pottery from the ash. America is a land of extremes isn’t it? My daughters carried little bottles of ash around the world with them for years afterwards. I’m not sure if they still have them. I was discussing with my youngest daughter who lives north of Seattle now whether she still has all her decorative crystal stones from India. Apparently those were lost in her frequent moves! lol. I can assure you I looked with care at Mt Baker and Hood whenever we visited with her when we could still travel. Yes I wrote this in rough format quite a long time ago as memories were fresh and I had access to records of mileage and costs which have since been lost in our many moves. I have a fairly comprehensive record of my life but even so relatives and friends of times gone added to what I needed to be reminded of from days of childhood. My original purpose was to leave all this as a reference point for my children. I wish I had more information on the lives of my ancestors as I find history an engaging subject, particularly as world history fitted in with the times of some of my ancestors who can be traced back to 1590 CE on my Mother’s side.